Can you name this once popular gourmet dish offered on the menus of formal state dinners? Presidents Theodore Rosevelt, James Buchanan, and Milliard Fillmore included it on their menus for presidential dinners. John Adams ate it several times during the Continental Congress. It was William Howard Taft’s favorite food. Mrs. Taft hired a special cook to prepare the dish, which the president preferred to consume with champagne. Even Dwight Eisenhower served it on special occasions. Yet most Americans have never tasted this concoction. That's surprising considering it was once a favorite American dish. The answer is: Turtle soup! Turtle soup became so popular that it migrated from presidential dinners to restaurant menus, and then to American kitchens. By World War II, however, busy chefs had switched to cheaper and much more convenient canned options, like Campbell’s Turtle Soup. Yet, by the 1960s the soup had disappeared from restaurant menus. So, what happened to turtle soup, or another version made with diamond back terrapins? The diamondback terrapin, a small turtle, living in the costal saltwater marshes, was also once a prized delicacy for making soups and stews. During the early part of the twentieth century this terrapin soup was so popular that it became “commercially extinct”—in other words, there were so few terrapins left that it was no longer profitable to capture and sell them. Today, many states several species of turtle are listed as threatened or endangered and cannot legally be captured or killed. This is because killing turtles or terrapins decreases the populations below sustainable levels. 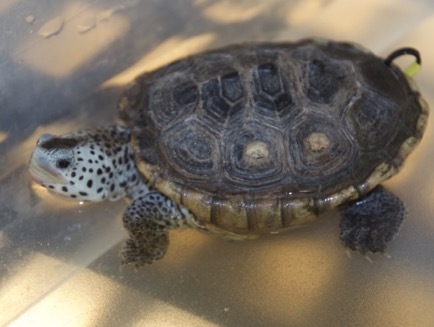 So, how did I become interested in the diamondback terrapin? 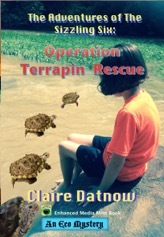 The fascinating research and conservation work of Professors Ken Marion and Thane Wibbles, in the biology department at UAB, launched me into writing The Adventures of The Sizzling Six: Operation Terrapin Rescue, (Book Seven) for upper elementary and middle grades. 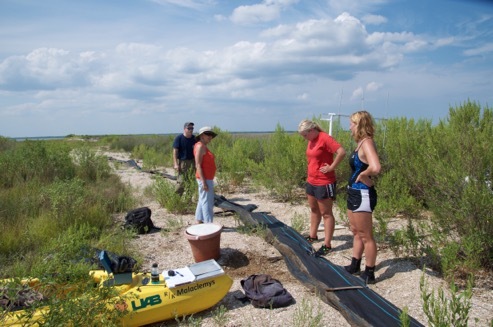 Over the course of a year, the professors generously allowed me to follow and video them into the beautiful Mobile-Tensaw Delta, the home of the diamondback terrapins. 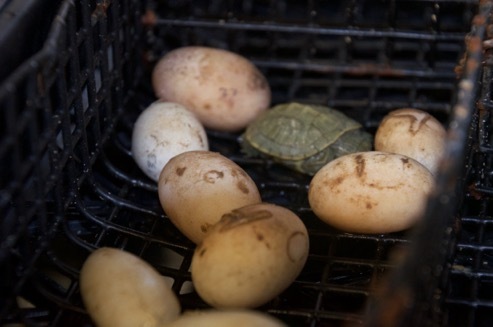 There I witnessed firsthand how they capture female terrapins for breeding their eggs in the terrapin hatchery at UAB. I shared the excitement and joy of seeing terrapins hatching from the eggs, and later the release of terrapins back into their home in the delta. "Diamondback terrapin 1. Latin: Malaclemys terrapin. The only species of turtle in North America, that spends its life in brackish water (a mix of salt and fresh water). 2. A species of turtle native to the brackish coastal swaps of the eastern and southern United States. 3. A species of Highest Conservation Concern. This particular adventure began with one of the worst oils spills in history. The president himself called it the worst environmental disaster the United States has ever faced. And it took us by surprise. The events that put my best friends and I, aka The Sizzling Six, on a collision course with this disaster began with an unusual lunch in my grandparents’ kitchen. Now that I’m thinking about it, the story began even before that, with an invitation to sped the summer at my grandparents beach cottage on the Gulf of Mexico. Let me begin by telling this amazing story as it unfolded." For the rest of the story . . . read the eco mystery now available for purchase on Amazon, Kindle, and iBooks. For more information on this and other books in the series visit.